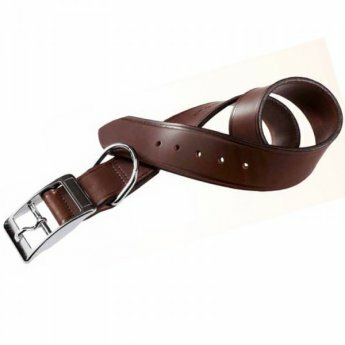 Our leather dog collars are made from mature Bull's leather which makes them not only strong but also very flexible. They will not stretch and with regular leather care will last a long time. Fitted with a Indigo Collar Tag for you and engraved with the text of your choice. All Indigo tags are made from top quality surgical grade stainless steel and deeply engraved. The tag will not rust or fade and is guaranteed for the life of your pet. The correct size tag will be provided with your collar choice..
Top Quality Leather Dog Collar complete with Indigo Collar Tag engraved with your identification / name details. Engraving details have a character limit per line. See below. All engraving characters for your tag will be upper case only. Lower case characters will be converted to upper case when your id tag is engraved.